The RP Photonics Buyer's Guide contains 69 suppliers for anti-reflection coatings. RP Photonics has the powerful RP Coating software for designing anti-reflection coatings of any type. An anti-reflection coating (AR coating) is a dielectric thin-film coating applied to an optical surface in order to reduce the optical reflectivity (reflectance) of that surface due to Fresnel reflections – at least in a certain wavelength range. Examples for the application of such coatings are spectacles, optical systems like camera objectives, optical windows, displays and solar cells. In most cases, the basic principle of operation is that reflected waves from different optical interfaces largely cancel each other by destructive interference. Note that there are also anti-glare surfaces, which suppress reflections in a completely different way: by diffuse scattering from a microscopically rough surface. Such surfaces are suitable e.g. for some viewing ports, but normally not for laser applications, and should be carefully distinguished from anti-reflection surfaces. In the simplest case, an anti-reflection thin-film coating designed for normal incidence consists of a single quarter-wave layer of a material the refractive index of which is close to the geometric mean value of the refractive indices of the two adjacent media. In that situation, two reflections of equal magnitude arise at the two interfaces, and these cancel each other by destructive interference. It is not always possible to find a coating material with suitable refractive index, particularly in cases where the bulk medium has a relatively low refractive index. A single-layer coating works only in a limited bandwidth (wavelength range). If no suitable medium for a single-layer coating can be found, or if anti-reflective properties are required for a very broad wavelength range (or for different wavelength ranges simultaneously, or for different angles of incidence), more complicated designs may be used, which usually have to be found using numerical techniques. A general trade-off of such multilayer designs is between a low residual reflectivity and a large bandwidth. 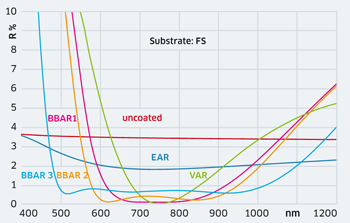 So-called V coatings have a high performance only in a narrow bandwidth (order of 10 nm), whereas broadband coatings offer moderate performance but in a wide wavelength range. 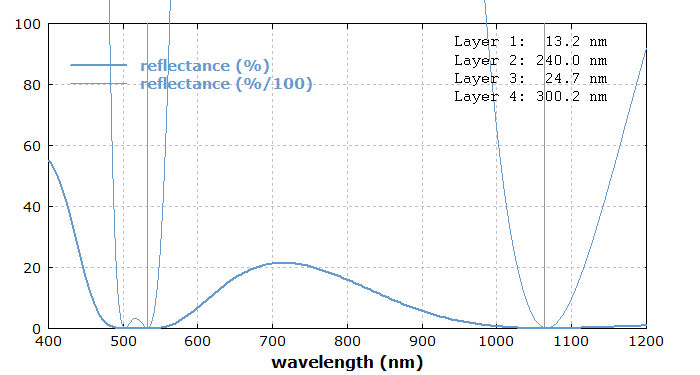 Figure 1: Reflectivity curve for a numerically optimized anti-reflection coating on a BK7 glass substrate for 1064 nm and 532 nm. Two layer pairs of TiO2 and SiO2 are used. The coating design was made with the software RP Coating. Apart from those properties, the tolerance to growth errors may also be of interest: there are sophisticated coating designs which reach a high performance only for very precise manufacturing. The growth error tolerance is therefore an important aspect to be considered in the design. Analytical design rules exist for simple types of anti-reflection coatings with very few thin-film layers. For more sophisticated designs, numerical optimization algorithms similar to those described in the article on dielectric mirrors can be used. The resulting designs are normally not easily understood, as the anti-reflection properties result from a complicated interference of the reflections from various interfaces. A wide range of possibilities arises from gradient index coatings (or graded-index coatings) [2, 3, 11], where the composition of a layer material is gradually varied. In the simplest case, a smooth index transition between two optical materials over a length scale of a few wavelengths can suppress fairly well the reflection over a wide spectral and angular range. This is difficult to realize, however, for surfaces next to air, since all solid materials have a refractive index significantly different from that of air. One solution is to use nanooptics in the form of sub-wavelength pyramid structures or the like (moth eye structure), see e.g. Refs. ,  and . Such structures imitate a smooth transition of the refractive index to 1 by smoothly reducing the amount of solid material in a plane parallel to the surface. However, there are also solutions without nanooptics, in particular the integration of gradient index layers into a multilayer coating. This allows for good broadband anti-reflection properties in a wide angular range without using materials with a very small refractive index. An unusual type of anti-reflection coating is one consisting of a very thin layer of some strongly absorbing material. The thickness can be only some tens of nanometers, i.e., far less than usually required for lossless AR coatings, as strong imaginary components of the propagation constant of such media lead to substantial phase changes. The incident light is largely absorbed by such structures, rather than transmitted. Such anti-reflection structures are sometimes called photonic metamaterials due to the combination of sub-wavelength structures, although simple interference phenomena are sufficient for understanding their characteristics . Anti-reflection coatings  are often used for optical components in order to reduce optical losses and sometimes also the detrimental influence of reflected beams. The residual reflectivity for a given wavelength and angle of incidence is often of the order of 0.2%, or less (in a limited bandwidth) with careful optimization. For application on prescription glasses, the achievable suppression of reflections is significantly lower, since the coating must operate in a wide wavelength range and for a wide range of incidence angles. AR coatings are also used on laser crystals and nonlinear crystals. In such cases, additional challenges can arise from anisotropic thermal expansion e.g. of lithium triborate (LBO) crystals. In most cases, AR coatings are used on optical interfaces with an area of at least a few millimeters squared. However, it is also possible to produce such coatings on the ends of optical fibers, sometimes even in jacketed and connectorized assemblies. There are various technical difficulties, e.g. related to outgasing of polymer jackets in a vacuum chamber and to the limited number of fiber ends which can be treated in one batch, but specialized sputtering processes have been developed which mitigate these problems. The coating performance can be as good as for normal bulk surfaces, at least for simple coating designs with only fewer layers. Apart from the reflection properties, the optical damage threshold of anti-reflection coatings can be of interest, for example for use in components for Q-switched lasers. Depending on the material combination, an AR coating can have a higher or lower damage threshold than the substrate material. Even for given coating materials, the damage threshold can vary considerably depending on the fabrication technique. Ion beam sputtering is known to allow for relatively high damage thresholds. In the EKSMA Optics IBS thin-film coating facility, we can design and produce complex low loss anti-reflection coatings to suit your application. LASEROPTIK offers a wide range of anti-reflection coatings for various types of optical elements in different wavelength regions from the mid IR to the UV. We can also supply coatings on special substrates and coatings for special applications. Iridian provides coating services for a variety of component materials such as glass, silicon, semiconductors and certain plastic substrates or films. Precision coatings can be applied to beam-splitters, prisms, lenses, mirrors, windows, ferrules and laser facets. Both prototype volume and high volume capability is available. Coating types include simple anti-reflection (ARs) and broadband coatings.